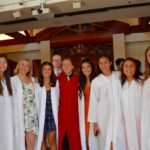 Big Bear, CA – Last night, 55 graduating seniors were awarded a total of $121,900 through the Steven G. Mihaylo Big Bear High School Education Foundation. Scholarships ranged from $1000 to $10,500. This endowment program consists of Corporate Sponsors and Foundation Families through a matching grant program established by Steven Mihaylo. The endowment has grown to over $2.5 million dollars since it’s inception 19 years ago. To date, $1.2 million dollars in scholarship money has been awarded to a total of 612 students. 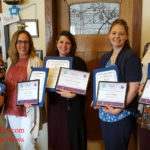 In addition to the scholarship program, the Mihaylo Foundation established a mini-grant program for teachers totaling almost $24,000 this year. At last night’s ceremony at the Performing Arts Center, student recipients were given the opportunity to acknowledge one teacher who influenced them during their years in the Bear Valley Unified School District. Special recognition was given to Al Waner, one of the founding board members, who is stepping down after 20 years of service. 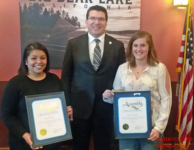 In addition to the Mihaylo Foundation awards, on June 4th, the annual Big Bear High School local scholarship program donated over $100,000 to students. For many local students, these scholarship programs make their dreams of attending college, community college or vocational school a reality.